HOW asking the RIGHT questions about what's getting in your way...can open up your path to success! | The Fresh Approach Podcast: Skills & strategies to live your healthiest & happiest life! Before we get started, I told you I’d have news for you about HOW we can work together, one-on-one, this fall! If you’re ready to wake up every morning feeling inspired by your goals…motivated to take the very best care of yourself…with the confidence that you know how to manage emotional eating, cravings, mindset issues, and prevent yourself from going “off track”…then it's time for us to talk! CLICK HERE to watch my video so I can tell you how it all works and how you can set up your FREE 30-minute Get Clear Strategy session with me! In this podcast, we're talking about how YOU can begin asking YOURself the questions that matter, so you can turn that roadblock into your path to success! 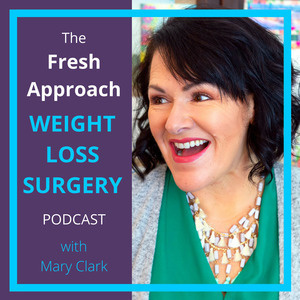 Too many WLS friends get caught up in the “I haven’t been able to exercise,” and let it go at that - which leads to no progress toward their goals, which leads to them feeling bad about themselves...but we've already decided we're DONE WITH THAT! We're asking more questions, getting more curious, more observant about what’s really happening - what’s truly getting in the way of making progress toward our goals and questioning if our reasoning about WHY we can’t do something - if it’s really true? To join the Fresh Approach Facebook Group, CLICK HERE. There are three quick questions to answer before you can be added.